Rosehips are abundant in early Autumn and Rosehip syrup is a great source of Vitamin C and can be used to boost the immune system and prevent coughs and colds – apparently anywhere up to 20 times as much Vitamin C as citrus fruits. This is a simple enough recipe, with few ingredients and just a bit of preparation required. For the traditionalists, Rosehip syrup is made with Rosa canina – Wild or Dog Rose. The Rosehips are a distinctive red-orange, bullet shape but can be quite tough and difficult to process early in the season, then disintegrating to the touch much later on. You can also use hips from other varieties of Roses, Rosa rugosa with it’s fat, almost Tomato-like hips is a common escape around Glasgow and provides much more juicy flesh to extract. I like to use a mixture for convenience, whilst also ensuring plenty of quality, wild constituents – Roses that have been bred for blooms will not necessarily have the same therapeutic properties as their wild cousins. An important safety point, it is best not to pick from ornamental Roses, both ethically – they belong to someone else – and because they may have been sprayed with chemicals that you would rather not ingest. Use the Rosehip syrup through the winter to supplement Vitamin C, or as a topping for desserts. Chop your Rosehips up a fair bit to get the most from the extraction, and get them gently cooking as soon as possible to preserve the Vitamin C. Over-cooking can also reduce the amount of available Vitamin C.
If you are using Rosa canina you may find the small hairs on the hips and seeds slightly irritating – wear gloves if you’re particularly sensitive and don’t squeeze the pulp in the jelly bag as some of the tiniest hairs may come through. So, I’ve got a bit of a cold and, being a good herbalist, I’ve neglected to look after myself properly and have only just remembered the bottles and bottles of soothing Elderberry Vinegar that are sitting in the spare / herbal room. Elderberries are full of Vitamin C and a great immune booster, they’re also conveniently in season in the Autumn, about the time the first colds are starting with the return to school and university and increased exposure to everyone else’s germs. I’m guessing this might also explain my current cold, everyone’s back to Glasgow with new and interesting bugs after far-flung festivities. I’ve recently taken to calling the sweetened Elderberry Vinegar a “Shrub” as some people find the idea of drinking vinegar a bit off-putting. The basic recipe for any Fruit Vinegar is here. Although it’s a bit late for foraged fruits here in Glasgow, you can also use shop-bought Raspberries or even Blackberries if you don’t mind the food miles. A more seasonal type of medicinal vinegar, which you can make now is the pungent, garlicky, herby Four Thieves’ Vinegar. Even better, although for maximum potency, your vinegar should stew for 2 weeks – the components of Four Thieves’ Vinegar are so strong, you’ll get some medicinal effects if you drink it with only a couple of hours of stewing. A couple of quick notes about making vinegars. 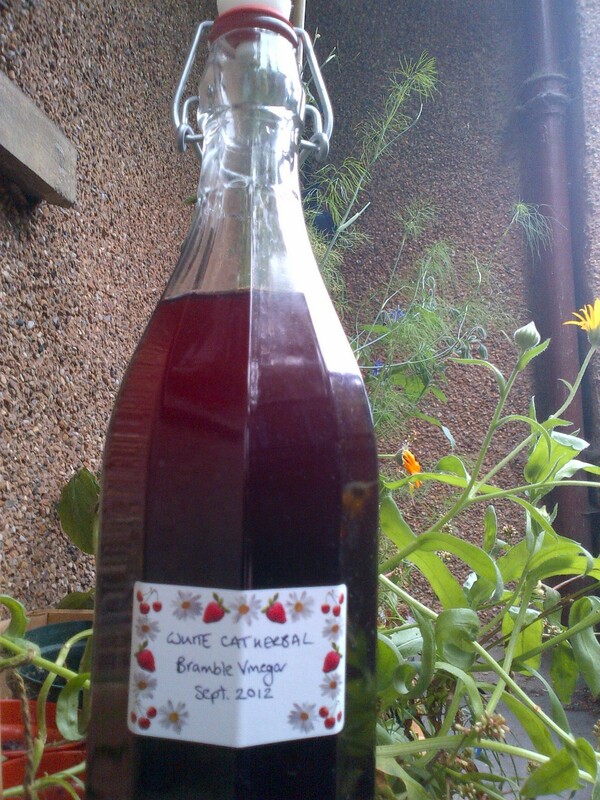 I often get asked which vinegar is best to use as the base to a medicinal vinegar or shrub. I usually go for Apple Cider Vinegar for stronger flavours like the garlicky Four Thieves’ Vinegar and/or if the vinegar isn’t going to be heated. White Wine Vinegar is best if the vinegar is going to be heated as part of the recipe, particularly to add sugar, as with the Fruit Vinegars. The direct heat denatures some of the ACV goodness and the blandness of White Wine Vinegar suits sweetening. It’s not essential to stick to these though, if you’re in a hurry and happen to have only one vinegar to hand, just use that. Another common question is around adding sugar and sugar subsititutes. The basic Fruit Vinegar recipe does add a lot of sugar and this isn’t essential for preservation, but does bring out the flavour of the Elderberries and Blackberries in particular. So, if you’re going to use your Fruit Vinegar as a culinary, Balsamic-like dressing, sweetening is really a must. If you’re going for a medicinal Fruit Vinegar, you could leave out the sugar in the initial recipe and then add sugar or honey to your warmed vinegar drink. Some people have suggested adding honey to the basic recipe, but I wonder if prolonged heat is good for honey and think adding it as you drink would be better. I’ve yet to experiment with using natural plant sweeteners like Stevia and would definitely avoid artificial sweeteners. A few weeks ago, another group of foragers (and a different dog, the lovely Dot), took a wander around Queen’s Park in the south of Glasgow. We really got a sense that Spring was moving on, the trees were greener, the Nettles bigger and the Coltsfoot coming to the end of its flowering season. The area around the pond was bursting with new life, lots of Mint, a little Lady’s Smock and many widespread medicinal favourites like Cleavers, Nettles and some tasty Cresses. We also found Hawthorn leaves to munch and the Sorrel getting bigger and bigger. After a quick run through of some plant ID pointers using Dandelion and Plantain, we headed back to Locavore to make some Nettle soup and an experimental Nettle and Apple juice using the trusty hand-juicer. We had a wonderful walk last Sunday in Queen’s Park, south Glasgow. It was a wee bit overcast and very windy in places, but we did have a gorgeous Cairn Terrier called Poppy to keep us amused. So, after a warming cuppa in the Glad Cafe, we set off towards the park. Our first find was Feverfew (Tanacetum parthenium) – great for fevers and especially migraines – there are just a few leaves visible just now and you can still smell the strong, medicinal aroma of parthenolides. One leaf per day – ideally with some bread, the leaf can cause blisters if eaten alone – will prevent migraine by dilating the blood vessels in the head, essential plant medicine. Then, to the Coltsfoot (Tussilago farfara) – hiding their bright yellow flowers without the sun, but still sweet and aromatic in the stem. The flowers come out before the leaves, unusual in plants and leading to folk names like Son before the Father. Coltsfoot is an excellent cough remedy and can be made in to a tea, syrup or tincture, the stems can be candied and sucked for a sore, cough-irritated throat. Up on the hill, we found the start of the Sorrel (Rumex acetosa) – a sour, lemony tang to the leaf, especially if torn against the grain. Highlanders call this Juicy Leaves and it is used around the world, particularly in former French colonies, for soup and sauces for fish. We also found a good display of Ribwort Plantain (Plantago lanceolata) – another great throat medicine, Plantain’s dual action of tightening and soothing mucous membranes and exposed surfaces makes it a great plaster for cuts (chew your own) and also for sneezes, especially of the allergic type. Maxime managed to spot a small grove of Hawthorn (Crataegus spp.) in leaf. The trees are slow to wake up, but you will find some very abundant hedges as strimming promotes early growth, although it does prevent flowering as Hawthorn flowers on 2nd year growth – less of this if you cut the year before. We spotted a couple of Hawthorn berries holding on from the Autumn – these are past medicinal or culinary use, but can still be good food for birds and probably squirrels. Hawthorn leaves are tasty in sandwiches and make a suprisingly substantial snack – their old name Bread and Cheese may refer to the rich texture or mouth-feel, rather than taste. We stomped around the windy hill, spotting the variegated leaves of Yellow Archangel (Lamium galeobdolon) – a Mint or Deadnettle with pretty yellow flowers which can be used in salads. Beside the flag pole we found a flourishing green medicine chest – Nettle, Garlic Mustard, Ground Elder, Cleavers – all great for Spring Detox juicing, soups and pesto. We also found the Queen’s Park Wild Garlic Patch – probably planted by a keen allotmonteer and just budding with the first pungent flowers. A little bit wind-worn, we wandered back down the hill towards Locavore, spotting a tub of Chickweed (Stellaria media) in the street. At Locavore we cooked up some Nettle and Wild Garlic pesto and sampled some 4 Thieves’ Vinegar I’d made earlier with Wild Garlic leaves instead of the traditional Garlic cloves. We also tried some very mustardy Lady’s Smock (Cardamine pratensis) – deceptively delicate pale-purple flowers with quite a punch. A great lunch and time to chat and share ideas for future walks – thanks for coming and for the photos and see you at the end of April. Medicinal plants have been part of the storytelling tradition for centuries – from fairytales to Shakespeare. 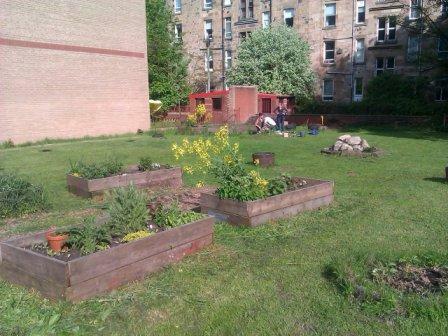 Amanda Edmiston of Botanica Fabula has written a wonderful new story about two brothers for the Battlefield Community Gardens, with appearances from 3 medicinal plants – Elder, Fennel and Violet. Amanda’s tale reminds us of the tortoise and the hare, with the tortoise-like brother tending and collecting plants along his journey. The plants then form a part in his proving how the quest ended. You can add your own moral, I like to think if we look after the plants, they’ll look after us. The Elder tree gives us two different medicines – from the flowers in Spring and berries in Autumn. The sweet, heady flowers can be used to make cordial or champagne or if you want to have maximum berries later in the year, just pick a few heads of flowers and make an Elderflower sugar. Elderflower tea is perfect for colds, ‘flu’ and allergies – with Nettle and Plantain they make a great hayfever tea, add Eyebright if streaming or irritated eyes are a problem. Elderberry is full of anti-oxidant vitamins and is a great anti-viral. You can make a syrup for coughs and colds or a culinary vinegar for salad dressings and marinades. You will know that your Elderberries are ready for picking when the purple berries hang heavy from the branches – you may also see pigeons happily munching away at the top of the tree. Elderberry seeds can be slightly irritating to your stomach, so do be careful if you’re eating any of them raw – just try a couple to check you have tasty, ripe berries, then make sure to process the rest well to remove the seeds or dry and use as a tea. Sweet, cooling violets make a great syrup for coughs and colds, especially for children. The cooling character is great for fevers and also the emotional heat of anger. For hot, angry skin conditions, Violet tea can be taken, with a Violet cream to soothe and protect. With a familiar kick of Liquorice-like aniseed flavour, Fennel is used as gripe water for babies to ease disrupted digestion and by mothers to help milk production. 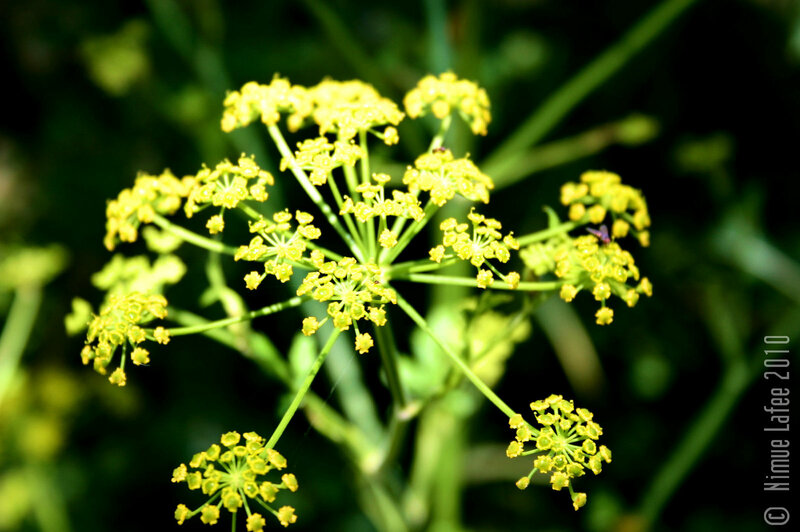 Fennel is a very portable medicinal plant – the tiny flowers and seeds are especially strong and pungent and can be nibbled to ease the stomach or the lungs – aiding clear breathing and good digestion to keep a traveller strong and nourished. If you’ve missed the flowers, the rest of the plant is also edible and medicinal and can be chopped to make a tea. Look out for more Tales of Medicinal Plants as the Battlefield Community Garden develops. September is only just upon us and in Glasgow it feels resolutely autumnal already. A quick walk in the park today turned up plenty of Rowan, ripening Hawthorn and Bramble and some fantastic polypore mushrooms (great cooked with garlic on toast). I also finally found my local Yarrow supply which has been hiding all year and is just perfect to dry right now – fully in flower with great, fluffy-spiked leaves. As it’s a Sunday, it was the ideal time for a trip to the country park and Finlaystone was full of stinky herbal delights – Figwort and Wood Betony were both in acrid abundance. I also added a large haul of windfall apples from a secret location off the Hillington industrial estate – thankfully my kind runner friends keep a look-out for interesting trees whilst they’re pacing the pavements and pointed me in the right direction. 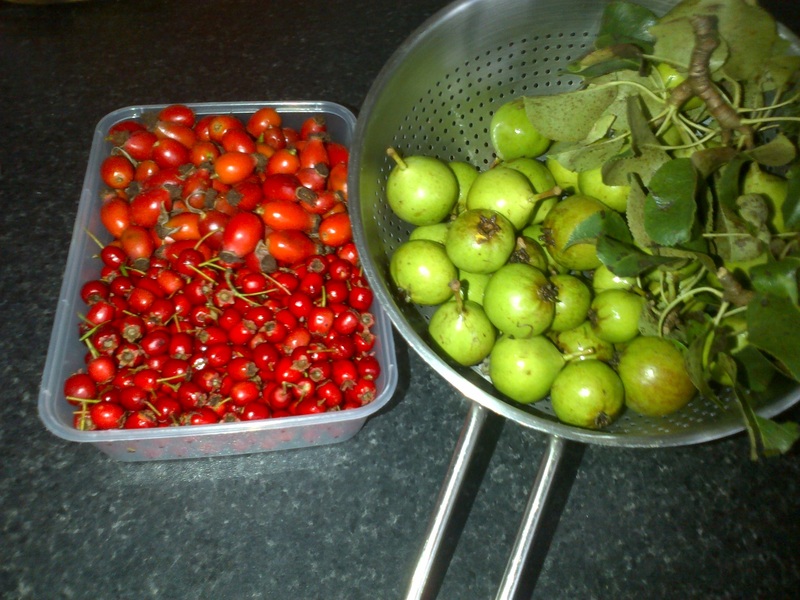 Stuff you find in hedges, in a condiment – it’s important to get plenty of pectin in to set the jelly so make sure to have loads of crab apples, about the same weight as the total of the rest of your hedgerow fruits. First of all, collect some rosehips, brambles, rowan berries, plums (other recipes says sloes, you are mad to use the rare Glasgow sloes for anything other than gin) and plenty of crab apples. Eat during the year with meat, cheese and in sandwiches. If you squeeze the jelly bag too much the final result will be cloudy, but there will be more of it. The easiest way to find the “setting point” is to pour a little bit of the mixture on to a fridge-cold plate or saucer. Then let it cool and push your finger through – if the surface wrinkles, you are at the setting point. If not, keep boiling for another 5 minutes and try again. I can also heartily recommend the Haw-Sin sauce recipe to use your Hawthorn berries when they ripen. Another sunny day in the south of Glasgow and a brave dozen set off to Queen’s Park for a Sunday afternoon forage. We started the walk at Locavore‘s new shop on Nithsdale Road and a little home-made Elderflower champagne. One of our first encounters was with the wonderful Lime (Tilia x europoea) – a tree whose sweet, mucilagenous buds and flowers make a quick walking nibble and a tea to relax and ease anxiety. Limeflowers have a short season and we spotted only a couple out in full bloom. Once they do pop it is said that you can hear a Lime tree before you see it, due to the volume of buzzing insects feeding on the nectar. The Lime tree is also a friend to parents, apparently “fractious” children can be left under the tree for a wee calm down. Around the pond we found some Watermint – in the running for a future beer but stronger smelling than it tastes – and lots of Plantain (Plantago spp). Plantain is a great healing plant and extremely widespread. The two main species are Broadleaf (Plantago major) and Ribwort (Plantago lanceolata). I tend to use the two interchangeably for the handily combined action – both soothing and tightening – useful for wound healing when used externally and for sinus problems and allergies as a tea. Both varieties have a distinctive horizontal ribbing on the back of their leaves – making them distinguishable from other, similar, scrubby-green-leafy-things. We saw some massive Broadleaf specimens – certainly dinner-plate size, although they can be small enough to confuse with Daisy leaves. The Ribwort has lance-shaped leaves and a central spike which looks like a reed and the flowers have a pleasant, mushroomy taste. Queen’s Park has a small but vigourous patch of Meadowsweet (Filipendula ulmaria) which was our main beer-related option. According to our brewer Declan from Clockwork Beer company, Meadowsweet was used in the past in Scotland instead of Hops – as these are native to the south of England. I wonder if this explains the large amounts of Meadowsweet outside the Tennent’s Brewery near Glasgow Green? Medicinally, Meadowsweet contains salicylates – also found in Aspirin – which account for its pain-killing properties. Meadowsweet is also regularly used as an anti-acid for heartburn. This dual action is a great illustration of the complementary character of whole plant medicines – the isolated compound as used in Aspirin can cause acid problems, whereas the whole plant protects against them. Along the way we also found some great nibbles in Sorrel leaves and Red Clover flowers and some yet to come in ripening Hawthorn and Sloe berries. We rounded off the walk with some Nettle beers at Clockwork and ideas to create the next foraged beer.